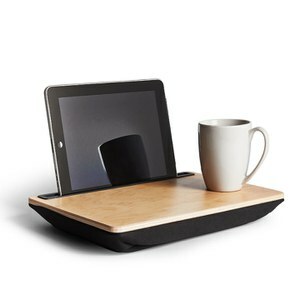 The Black iBed will allow you to use your iPad in bed, on the sofa, on a plane and much more. Filled with microbeads for added comfort, the tray features a slot to place your tablet, and boasts a non-slip surface, so you can place drinks and plates on it too. Functional and stylish, it's the perfect gift for any iPad owner. - L.M. Dimensions: L:9.45" x W:11.42" x H:1.18"
This table/desk is great for people who like to eat or drink in bed. Its also great for tablet/ IPAD users who just dont feel like holding their ipad in their hands whilst watching series or doing whatever. The Ibed is great can deal with everything on my iPad and place snacks And drinks on the tray. This item was delivered very quickly and is of a good quality. Well worth the money paid for it. Fits my lenovo tab perfect. Can sit and have a cup of tea and watch vids easily. Also brought one for me dad for fathers day! Bought this as a gift for my mom who uses her iPad all the time. She enjoyed it and likes it a lot .. only problem is, it's a bit small. So, the coffee cup and the plate you can put on the surface have to be small ... However, it's still a great product. Useful when using tablet whilst eating/drinking. absolutely brilliant. just the right size. for a plate and cup. also brilliant for putting your tablet . would recommend to everyone I know.